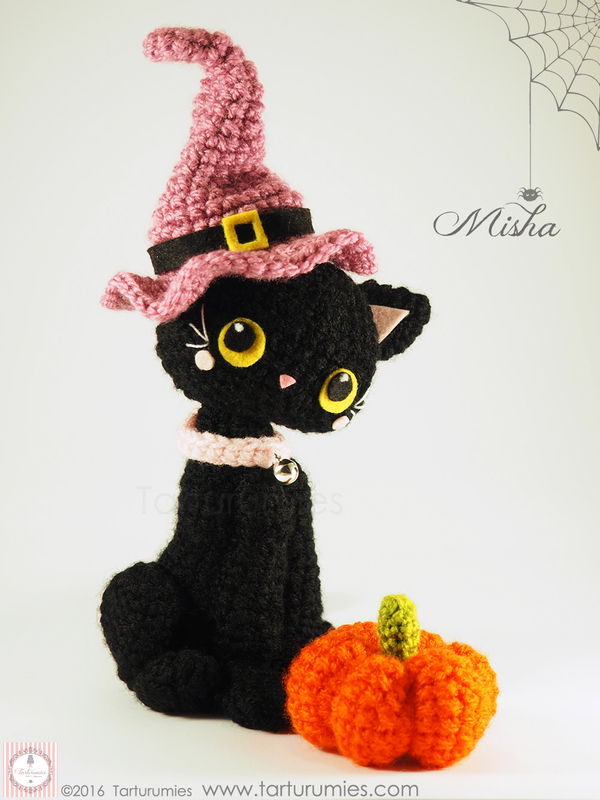 In the history of Halloween, the black cat is a very famous character. It is considered a disguise used by witches to walk quietly through the streets of the city. Next you will find the pattern, and also the option to download the PDF, more detailed and to archieve with your pattern collection – Remember that with the download, which is totally free, you are collaborating with Tarturumies, giving us the possibility to continue creating free patterns to share with you all. Worked in continuous round with black color and 3,5mm hook. Worked in joined round with black color and 3,5mm hook. Stuff the piece as you crochet. Fasten off, leaving a long tail. Don’t fill the thin side (that is, the ankle). In order to shape them into paws, starting at the bottom of the feet, bring the long yarn tail with the needle and go through to the other side of the foot (the top), turning the needle while inside and bringing the needle towards the same point where you started (the bottom) and continue to go through (adjusting as you go) and repeat the same procedure from the other side of the foot. Once both sides have been completed, go from the bottom of the paw all the way to the other side of the thigh. Turn it a little in order to fold the foot/paw. Don’t fasten off yet! Stuff the piece as you crochet. Fasten off, leaving a long tail. In order to shape them into paws, starting at the bottom of the feet, bring the long yarn tail with the needle and go through to the other side of the foot (the top), turning the needle while inside and bringing the needle towards the same point where you started (the bottom) and continue to go through (adjusting as you go) and repeat the same procedure from the other side of the foot. Once both sides have been completed, go from the bottom of the paw all the way back to the very top of the foot/paw. Turn it a little in order to fold the paw. Don’t fasten off yet! Worked in joined round with black color and 2,5mm hook. Worked in row with light pink color and 2mm hook. Fasten off, leaving a long tail. Sew the bell on to sc #10 (in the middle of the collar). Don’t sew the ends together yet! Worked in continuous round with lilac color and 3,5mm hook. Don’t stuff. FO. Place the band around the hat and put the buckle centered with the tallest part facing vertically (see the picture). Form the hat to your preference! BODY -Worked in joined round with orange color and 3,5mm hook. STEM – Worked in joined round with green color and 2mm hook. The body of the pumpkin: Continue stuffing as you go along and push the stuffing towards the sides, leaving the center a bit more empty so that you can push it in a little at the top. Fasten off, leaving a pretty long tail. With this same tail we’re going to create the segments. With the yarn, go through the center and pierce through the base, turning towards the bottom so that a small cavity is formed in the center of the pumpkin (where we’re later going to put the stem). Pull the tail out and then put it through the center at the top, going through the base and repeat this in the same place once more (tighten the two stitches well to make sure that they accommodate both the stuffing and the segments. Repeat this 6 times, dividing the pumpkin into 6 segments. FO. The stem: Don’t stuff. 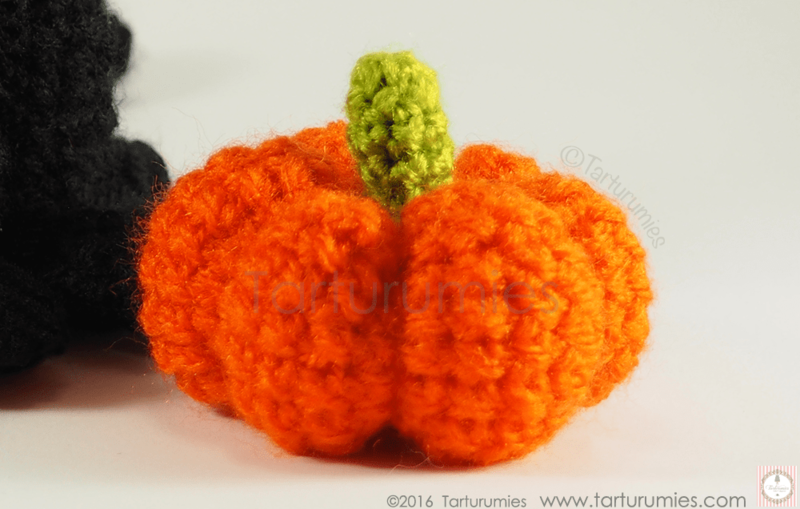 FO, leaving a long tail, and use that tail to sew it into the space at the top of the pumpkin. FO. 1.- Sew the ears to the head between rows 3 and 7 (counting from the top). 2.- Assemble the eyes, gluing the pieces together (see the images) and then glue them to the head between rows 10 and 12 (counting from the top) and leaving 4sc. of distance between them. 3.- Glue the nose to the head at row 12 (counting from the top) and centering them in relation to the eyes. 4.- Glue the cheeks to the head between rows 11 and 12 (counting from the top), one to each side of the attached eyes (see images). 5.- Glue the interior triangles to the attached ears (see images). 6.- Embroider the whiskers with white thread to the head between rows 9 and 11 (counting from the top) to sides of both eyes (see images). 7.- Sew the back legs to the body between rows 5 and 10 (counting from the bottom). Sew, following the thigh to the side (don’t sew the feet, leave them loose and fold them a bit to form the leg like shape). 8.- Sew the front legs to the body between rows 5 and 18 (counting from the top), one next to the other (don’t sew the feet, leave them loose and fold them a bit to form them into legs). 9.- Sew the tail to the body between rows 5 and 6 (counting from the bottom) and centering it in relation to the back legs. 10.- Sew the head to the body, centered. 11.- Place the collar on the neck with the jingle bell towards the front and sew the ends together in the back. 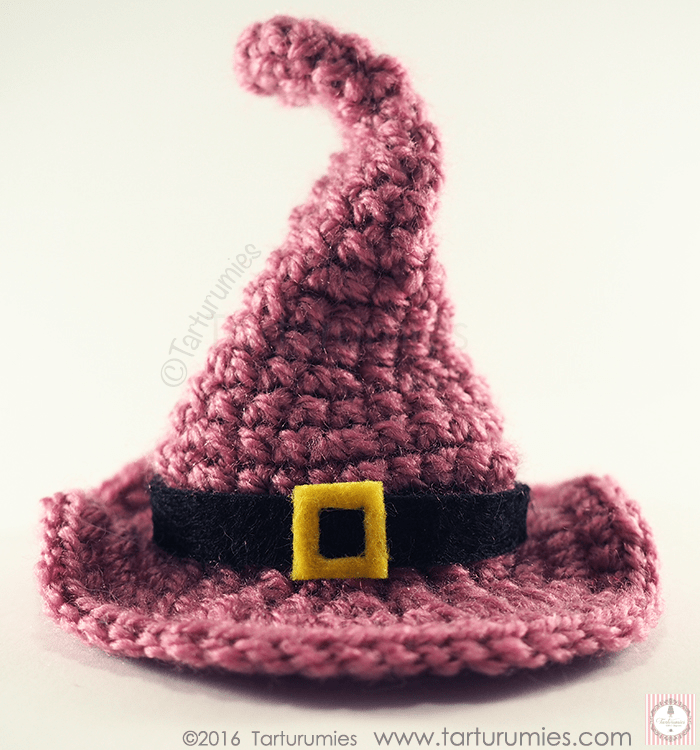 12.- Finally, place the hat on top, and if you’d like it there permanently, sew it there! NOTE 2: If you don’t want to glue the pieces of felt, you can sew them as an alternative! And you’re done!!! Enjoy your sweet Kitten!!! 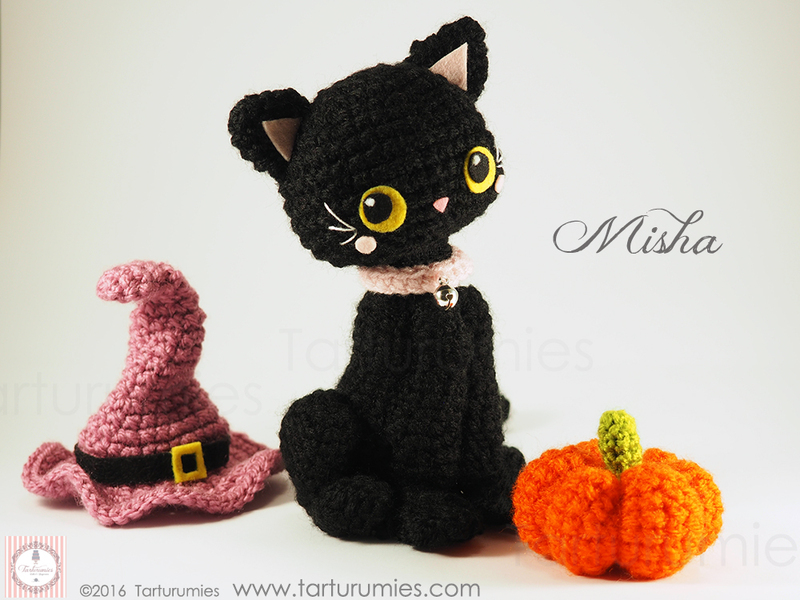 To download the pattern in PDF of our kitten just go to the link below and choose the language. 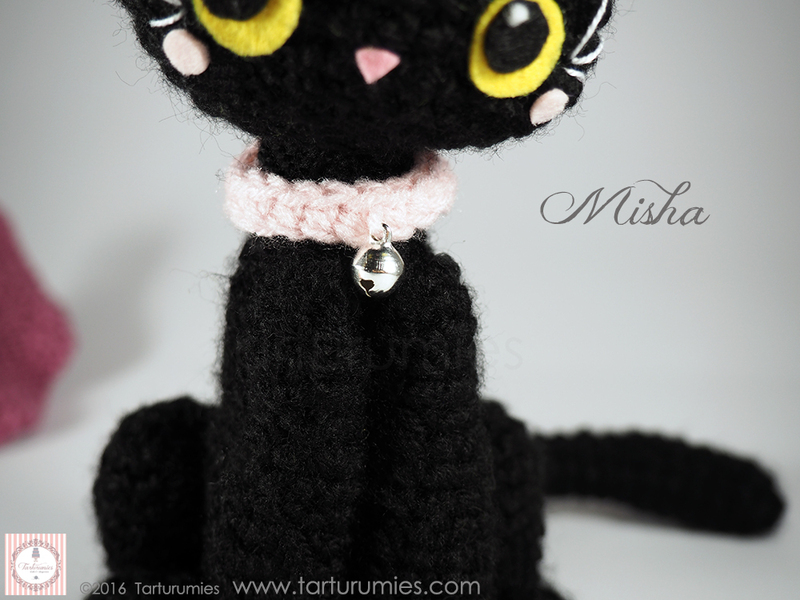 You can enjoy it and add it to the Tarturumies pattern collection!! 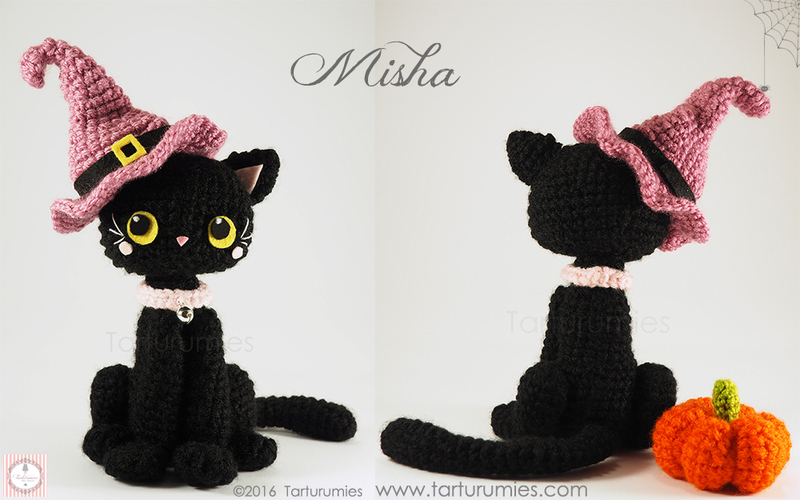 Cheer up and bring us your story, tell us why you have chosen our sweet Misha and share her with us !! !